Foley Sili-Elastomer Catherer by Medline is a new manufacturing procedure that provides good amount of Silicone coating available. 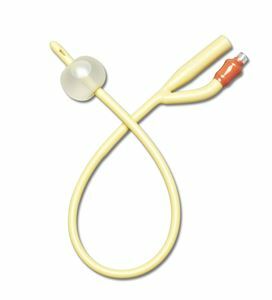 Catheter is made of latex with a coating of Silicone both internally and externally. Catheter also have tje capacity to keep the bacteria away. Features a balloon for more reliability. Large drainage eyes for maximum comfort. Available with 5cc balloon in 12, 14, 16, 18, 20, 22, 24, 26, 28 and 30 fr sizes.